One of the ways I try to be a good feminist is to put my money where my ever-blabbing mouth is. This means no shopping at Wal-Mart, amongst other places. Yes, I love a good deal as much as the next person and try to save money wherever I can. But I refuse to do so at the expense of women. Today, the Supreme Court will hear arguments in the largest employment class action suit in history, representing 1.5 million women against Wal-Mart. It’s taken a long time for this case to get to the SCOTUS; it’s gone through the 9th Circuit Court of Appeals three times already (each time it has upheld certification of the class-action suit). And yet, as NOW points out in its most recent action alert, Wal-Mart argues that each employee should be forced to file their complaints on an individual basis because a group this large couldn’t possibly have enough in common to constitute a class. The reason there are so many women in the suit is because Wal-Mart’s discrimination has been widespread and persistent. And now the captains of this ship want to be let off the hook because so many women were affected? Well, guess what: When you’re the biggest employer in the nation and the richest company in the world, and you get that way by paying unfair wages, you should expect to find yourself on the wrong end of a massive lawsuit one day. 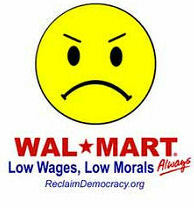 It comes with the territory, so Wal-Mart should stop trying to con its way out of court.